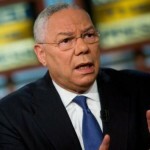 When the Rockefellerian, transnational progressive “Republican,” Colin Powell endorsed Barack Obama for president in 2008, he called Obama a “transformational figure.” His national psyop was tactically timed, two weeks before the election. Further, he propagated the lie that William Ayers has had only a “very, very limited relationship” with the putative president now making clearer than ever, his own strategic sabotage of America’s sovereignties, freedoms, and livelihoods. When Powell endorsed Obama, he sided with a clear and present danger to the American People’s constitutional governance and our declared independence. When Powell endorsed Obama, he effectively acted counter to his oaths of office, as an officer of our Army and as a Secretary of State. History will show that whatever transformation Powell had in mind, the “fundamental” transformation Obama embodied, then and through this moment, betrayed the trust America placed in either of them. Because of what he knew and the information available to him at the time, Powell made himself complicit and should not be expected to repent. Nevertheless, Powell is presented an offer to examine the accuracy of further comments, made since Obama became putative president. Below is the press release of the Birther Summit’s executive director, Dean Haskins. Will Powell schedule his exam? We would like to sit down with you and present evidence proving that what Barack Obama used to “blow away Donald Trump and all the birthers” was not actually a valid birth certificate, but a forgery. We would also like to present evidence to you of other dubious information Obama has used to misrepresent himself and his eligibility to hold the office of president, including his use of a Social Security number that appears to have never been assigned to him, and a forged Selective Service registration form. We suggest that such a meeting take place at an undisclosed location near Washington, DC, and that a small group of our experts attend the meeting, as well as a handful of carefully selected reporters who would attend to observe the meeting. We will arrange such a meeting place in an area of your choosing, and we ask that you allot us a three-hour time frame for the meeting. During this meeting, our experts will do most of the talking, so you needn’t prepare a speech. We will, however, ask only one thing of you: after our evidence is presented, you will either affirm that the evidence we present is sufficient for Congress to launch an immediate, non-partisan investigation into this matter (to include independent testimony and discovery), or you will refute our evidence. It must be understood that refutation of our evidence must be done with evidence, and cannot be anecdotal or rhetorical in nature. General Powell, because we value your past and present service to our country, and because we still believe that duty, honor, and country still matter, we affirm that you should be well compensated for your time, and are prepared to offer to you, or to Wings of Hope (or any other charity you may specify), a check in the amount of $15,000. Because of the gravity of this issue, we think that $5000 per hour for little more than listening to the truth should be fair compensation for your time. You stated that Barack Obama provided personal enjoyment for you by supplying what he called a “birth certificate;” now, we’d like to supply you with something of actual value just to see the irrefutable evidence and listen to the truth. You see, General Powell, we are not so easily blown away, and we hope that you will consider your place in history, and for what you will be remembered. Will you be likened to Gen. George Washington, or to Gen. Benedict Arnold? Will you be regarded for your honesty and integrity, or will it be for so fearing the facts that you would not even accept $15,000 for three hours of your time to be presented with them? These facts will be known by our nation, as the Birther Summit is committed to the relentless dissemination of them. Having weighed in on Barack Obama’s birth certificate publicly, you will now forever be linked to embracing what we can demonstrate to be a lie. You can set that record straight simply by listening to the truth, and also get paid pretty well for doing so (or you can provide a nice donation for a charity). To any question you may have regarding our ability to sustain fully what we have proposed to you, we have but three words: Yes We Can! Please visit our website at http://www.birthersummit.org and learn about who we are and the historic event we are planning for March 28-30 in Washington, DC. I await your response to our challenge. Five members of the press will be credentialed to observe this meeting. To apply for one of the available positions, please visit www.15000dollarchallenge.com and submit an online application. If you would like more information about the Birther Summit, please visit our website often at www.birthersummit.org. To schedule an interview with the event’s Executive Director, please email dean@birthersummit.org.